There are some interesting flights showing up on British Airways between Vancouver and Berlin, Germany (TXL) for early June 2015 travel. They're interesting not only because Vancouver to Berlin, Germany for $754 is an unusually low price in and of itself, but also because of the layovers involved. Which gives the possibility of visiting 3 countries in June for $755 CAD roundtrip (albeit 2 of them are pretty short visits). If one were inclined to do this, they would hit Western Europe, Central Europe, *and* Northern Europe/Scandinavia all on the same trip! Use dates in the first 2 weeks of June. June 1-11 is an example of one that works. 2. Then pick a return flight that has a very decent 2 hour stop on the way home. The travel time should show as being around 13 hours. Here's an example screenshot from FlightHub, involving flights from June 1 to June 11, 2015. For live discussion of this deal, or just to get some amazing travel advice (to anywhere) from 24,266 real travelers in Vancouver, join us in the YVR Deals Facebook Group. vancouver, yvr, flight deals, europe, northern europe, scandinavia, germany, central europe, western europe, united kingdom, nordic countries, london, sweden, england, lhr, gothenburg, got, berlin and txl. 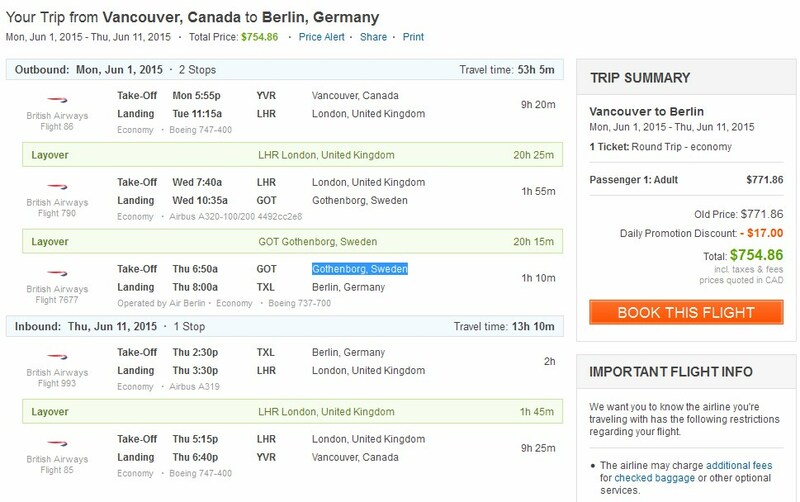 4 Responses to "Vancouver to London, UK to Sweden to Berlin, Germany - back to Vancouver | $754 roundtrip including taxes | June 2015"
Do you know if it would be possible to get a hotel stay with these 20hr layovers from the airline? DS: I know that Turkish Airlines offers a free hotel stay in Istanbul for really long layovers, and a couple other airlines do as well, but I don't think I've ever heard of British Airways offering that. Do you know if one could leave the airport in London or Sweden with British airlines?